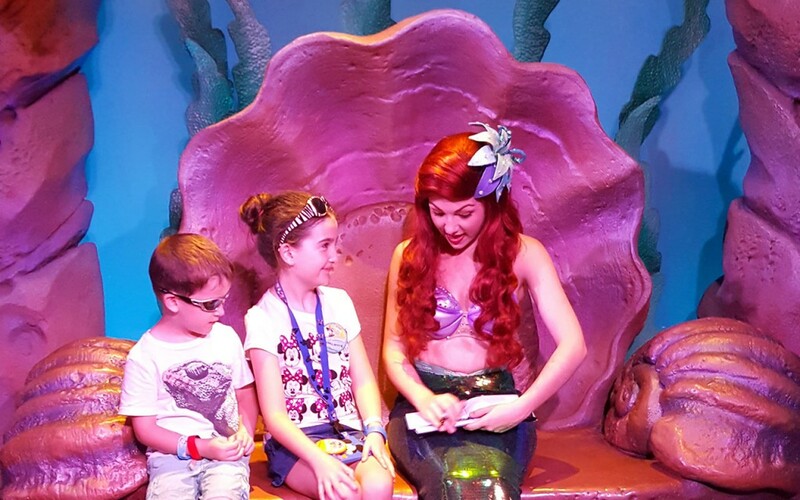 Over the last couple of years, we have had a few chances to meet Ariel from The Little Mermaid. 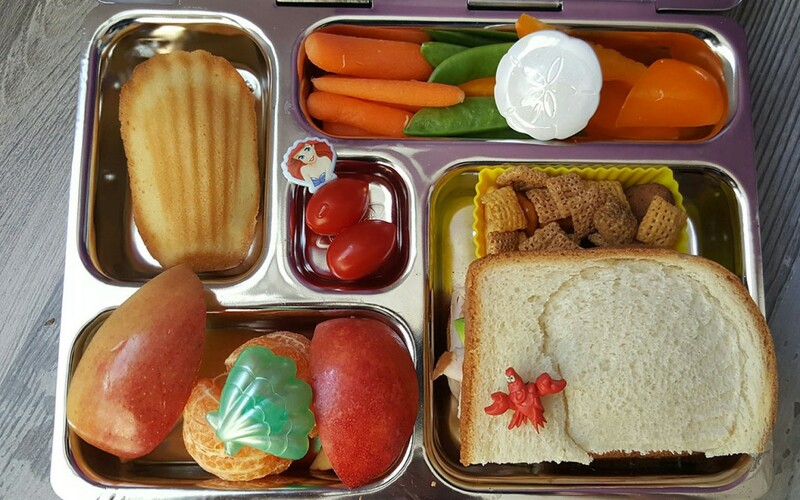 In this post, I will share photos from some of those meet and greets as well as a couple of mermaid themed lunches. 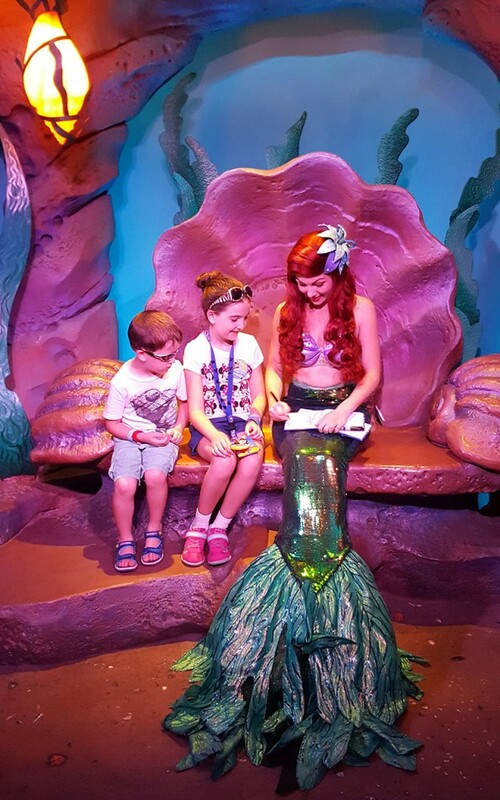 The first time we met Ariel, we saw her in mermaid form in her grotto at Walt Disney World. We saw her on the final day of our first family trip to WDW and we were lucky to get a last minute FastPass for this meet and greet. 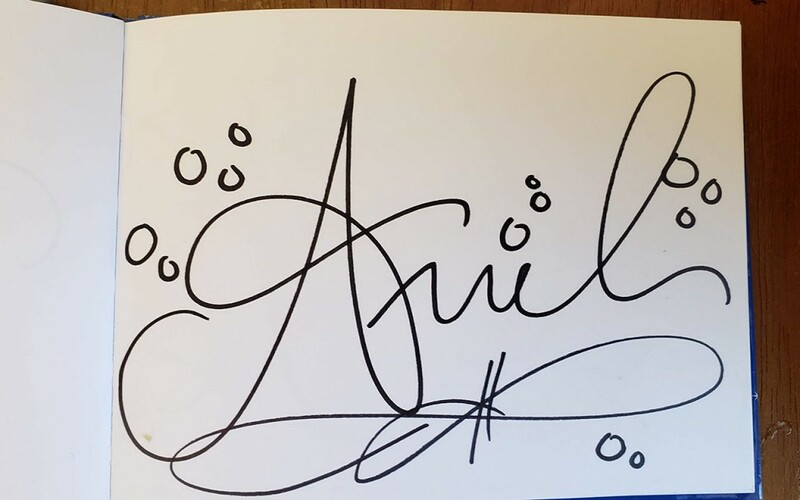 Ariel’s autograph was one of my daughter’s favorites from that first trip. She especially liked all of the rising bubbles. This was a fun meet and greet because Ariel was really positive, happy, cute and funny. 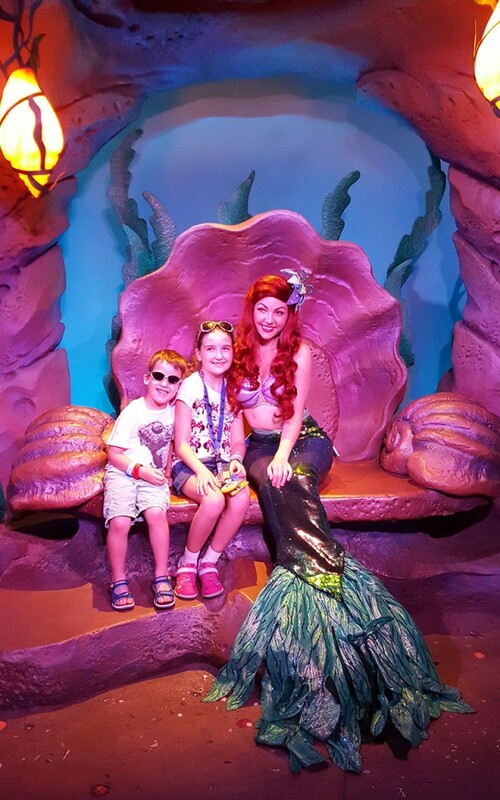 Our kids enjoyed sitting beside Ariel in the shell and felt comfortable talking with her even though they were much younger then. 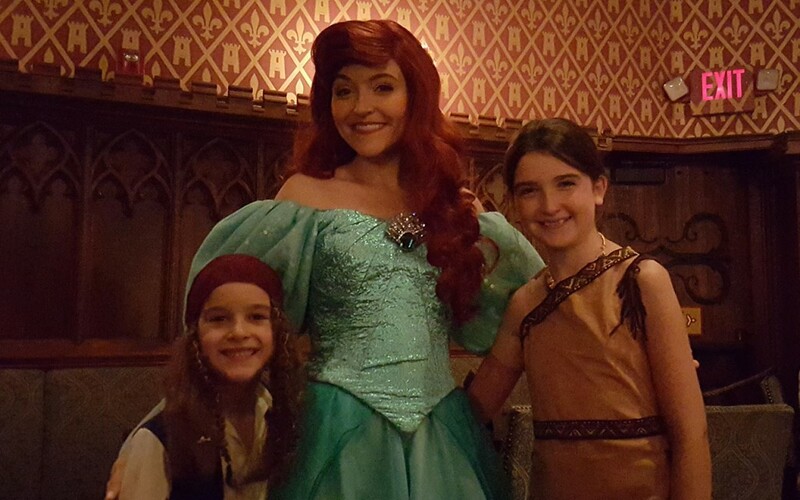 A few months later we met Ariel again, this time in her human form with legs at Cinderella’s Royal Table. A few months after that, we took a trip across country to Disneyland and Disney California Adventure. 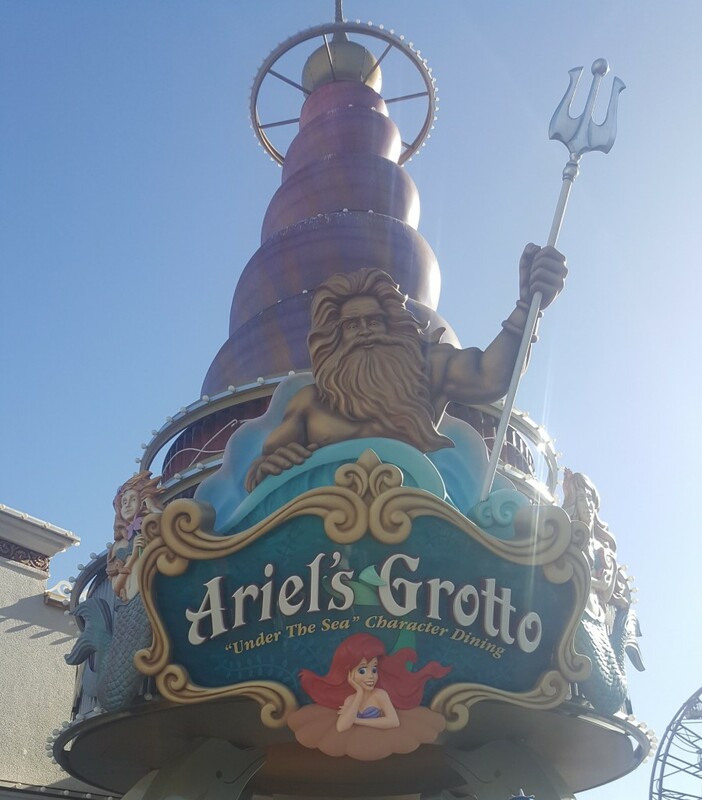 While there, we went to lunch at Ariel’s Grotto. That restaurant closed a few months after we visited when the area of Paradise Pier was modified to Pixar Pier, but we enjoyed our lunch at Ariel’s Grotto and we are glad we had a chance to go there before it changed. We took photos with Ariel while we were at Ariel’s Grotto but they didn’t really turn out that great because we were all a little flustered at that moment due to the fact that I had just realized that I didn’t have my phone. I was in a panic, partly because I had lost my phone, but mostly because I knew that I had lots of photos and video clips on that phone that had not yet had a chance to back up to the cloud! I was terrified that I had lost the photos of our kids meeting Cruella DeVille and several other characters that we had seen in Disneyland but would not commonly have a chance to see again in Walt Disney World. Luckily, my husband saved the day by running back to Cars Land where we had just ridden Mater’s Junkyard Jamboree. He asked for my phone and they gave it to him along with my external battery pack. 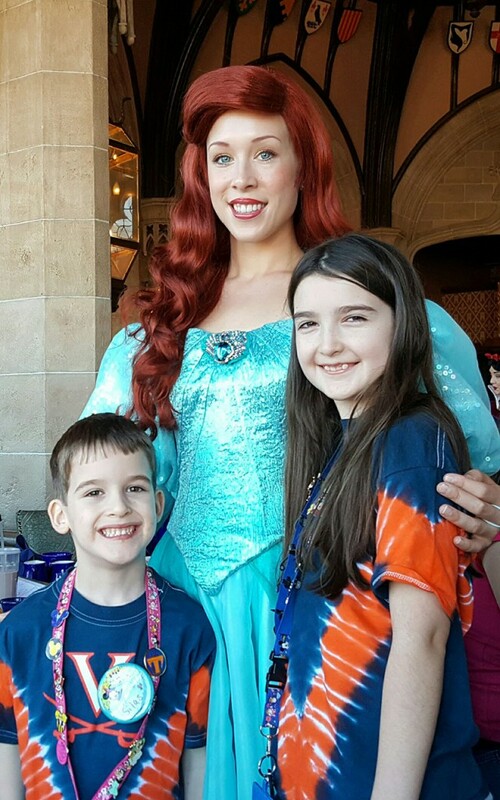 He ran back to us at Ariel’s Grotto just in time for our family to be called for our picture with Ariel before being seated at our table. After we had the phone back and and began eating lunch, we all enjoyed a good laugh about the irony that I had left my phone and battery behind at Mater’s Junkyard Jamboree because at the end of the ride Mater says (depending on which of the randomized songs plays during the ride), “Grab all yer stuff” or “Grab all yer junk, I’ve got enough junk of my own!”. Now, when we go on rides at theme parks, our kids love to tease me and say, “Mom, don’t forget your junk!” We made a family memory for sure! 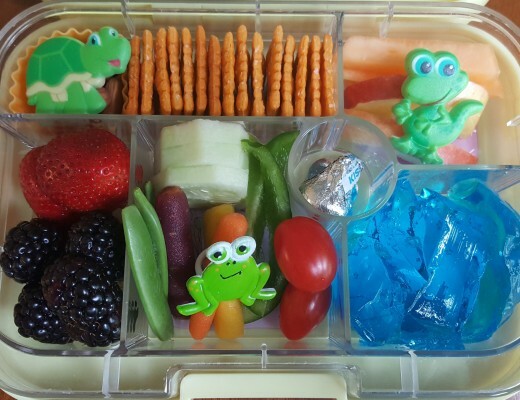 After the phone fiasco was over, we enjoyed our lunch and we had some fun desserts. 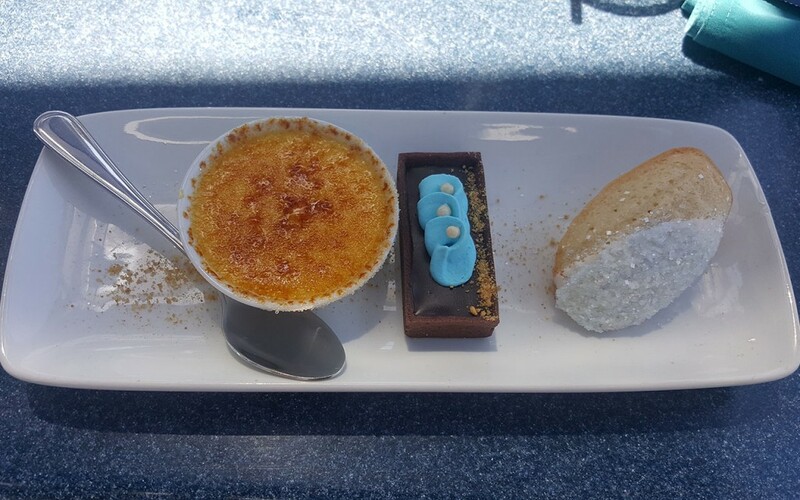 The adult desserts were served in this trio. 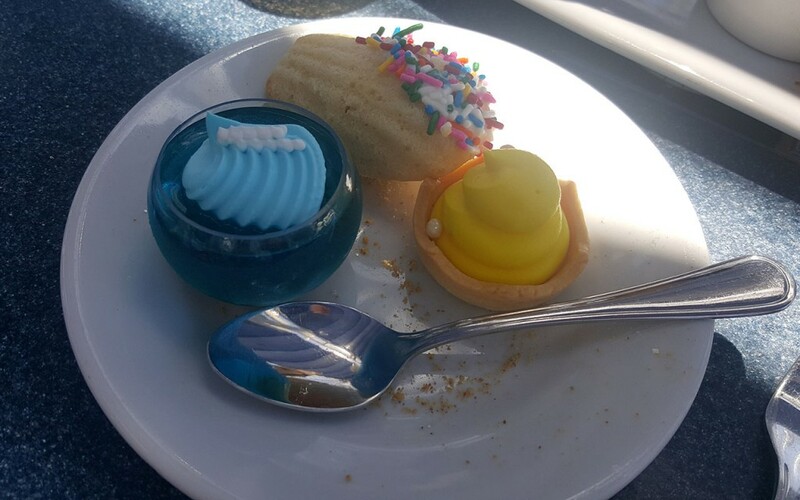 The kids desserts were served in this trio. 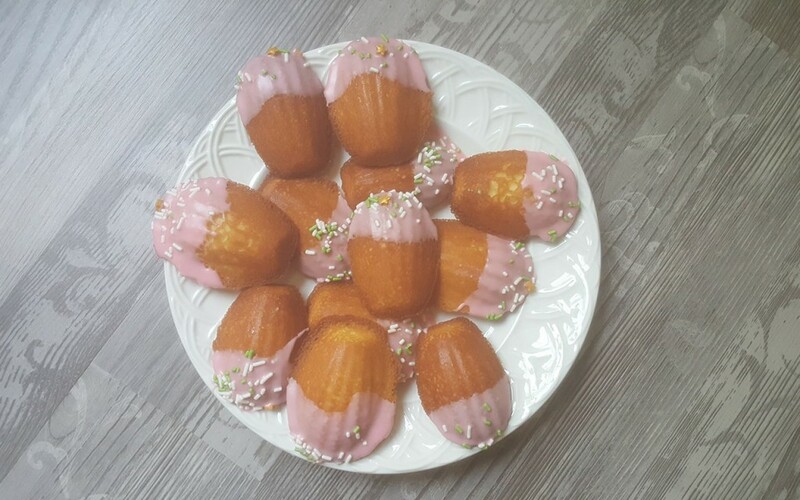 We even made our own copycat version of the madeleines a couple of times a few months later. We used this recipe and this pan. 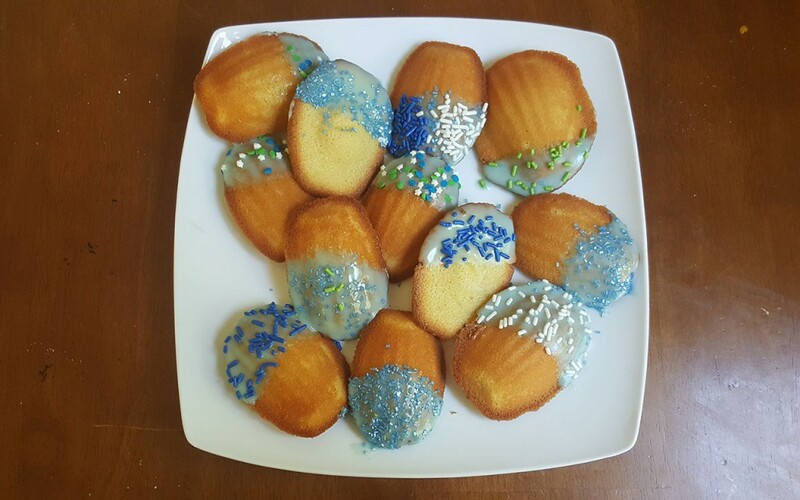 My son mixed the batter, dipped the cookies in the glaze, and added the sprinkles both times. 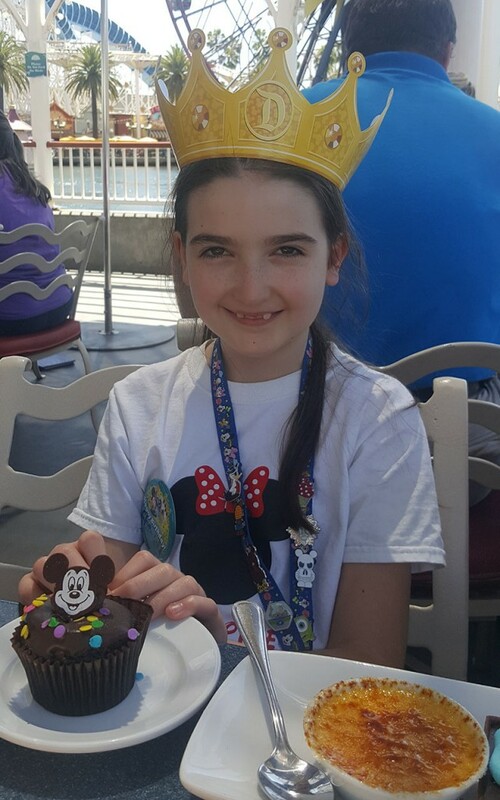 While we were at Ariel’s Grotto, a Cast Member gave our daughter a special Mickey cupcake to celebrate her birthday. A few months after our trip to California, we saw Ariel again at Cinderella’s Royal Table when we ate there for dinner. Our kids were dressed as Captain Jack Sparrow and Pocahontas at the time because we were visiting for Mickey’s Not So Scary Halloween Party. If you ever plan to go to Cinderella’s Royal Table, I recommend going during breakfast. 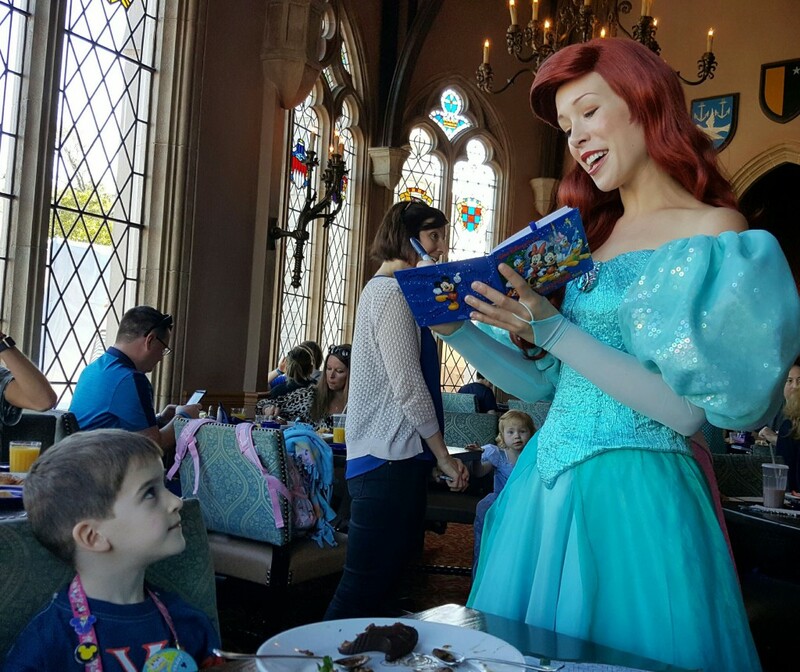 We preferred the meal at breakfast, but more importantly, during breakfast, sunlight enters the castle’s stained glass windows and this makes the photos with characters much better quality. During dinner, the lights are dim and the restaurant is fairly dark. 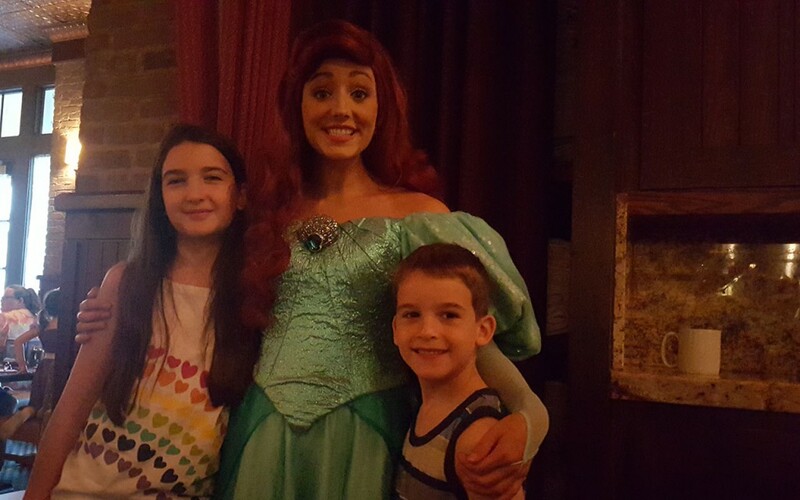 We also met Ariel along with Prince Eric at Trattoria al Forno. They have a character breakfast where the princes visit along with the princesses. 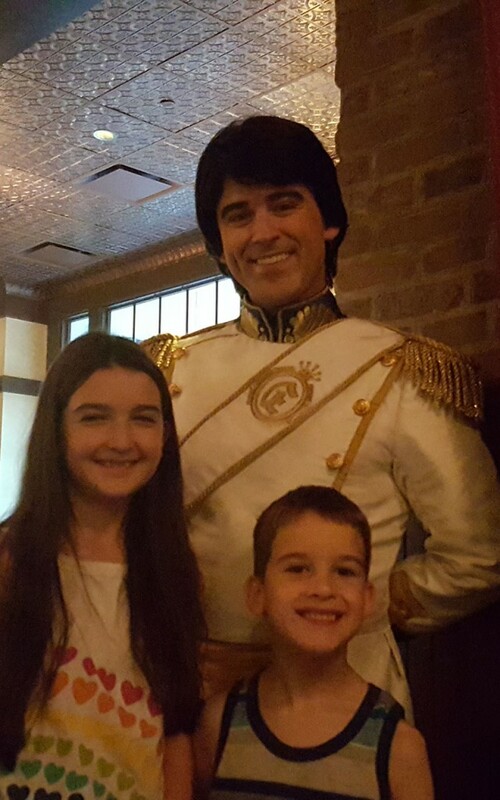 Our daughter really, really wanted to see Flynn Rider (from Tangled) and we had missed him in Disneyland so my husband faithfully checked the reservations daily at Trattoria al Forno until he was able to get a reservation for us. This pictures below Prince Eric and Princess Ariel from that breakfast. 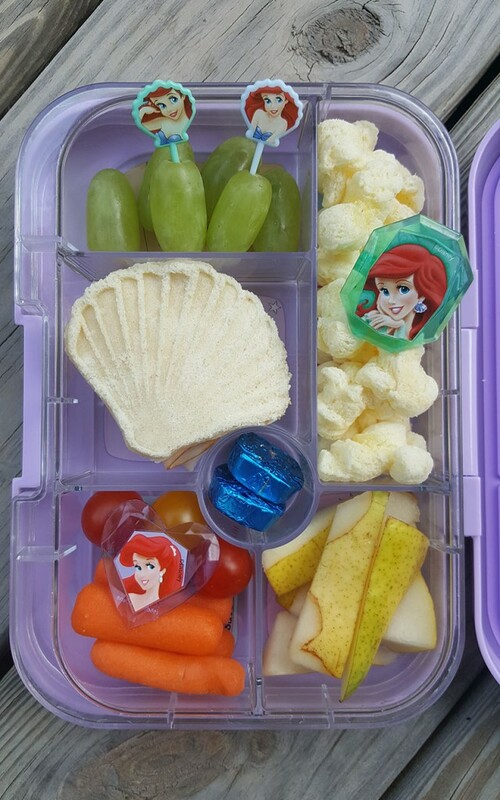 I have made several Ariel themed lunches for my daughter over the years, and one is below. 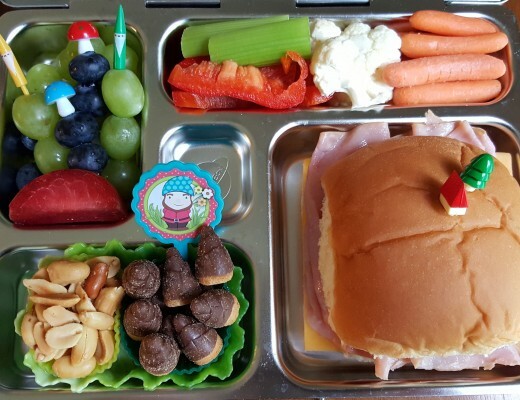 It includes a shell-shaped turkey sandwich made with this cookie press, grapes, hull-less popcorn, pear slices, carrots, tomatoes, and a couple of Dove chocolates. It included Ariel picks and Ariel cupcake rings. 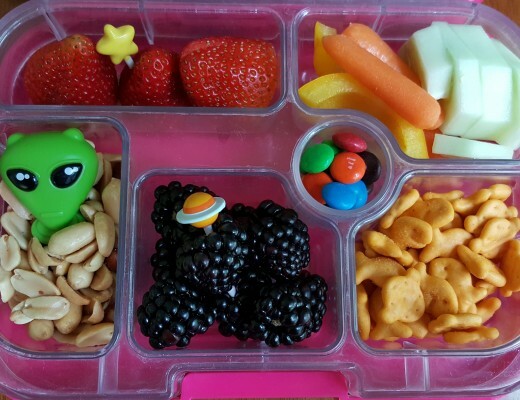 I found a perfect Lunchbox Love note to go along with this lunch too. 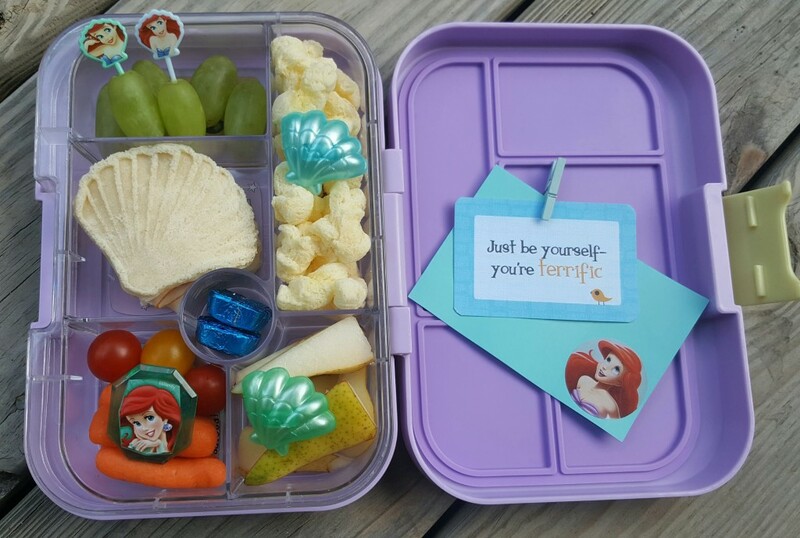 It said to “Just be yourself” which is what Ariel decided to do when she realized that she really wanted to leave the sea. 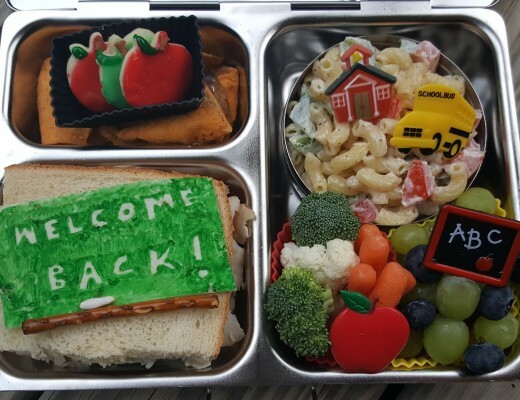 If you are looking for fun, handy notes to include in lunches, I recommend Lunchbox Love notes. 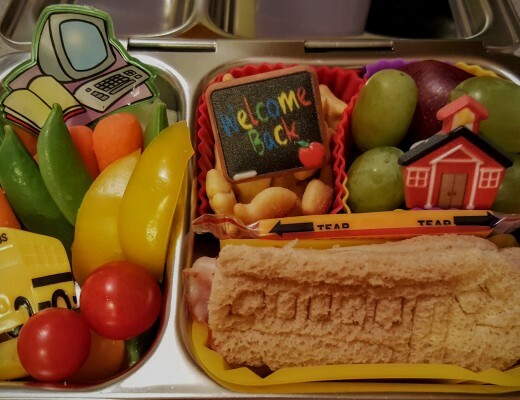 They are just the right size, printed on durable paper (they can hold up to a little moisture in the lunchbox), they are easy to write on if you want to add a little message of your own, and they are positive. They include a sentiment on one side and a little joke/riddle/fact on the other. 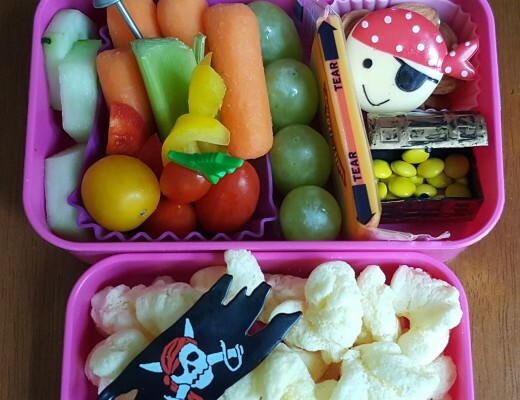 There are lots of sets and they are inexpensive so you can buy a bunch for a whole school year. 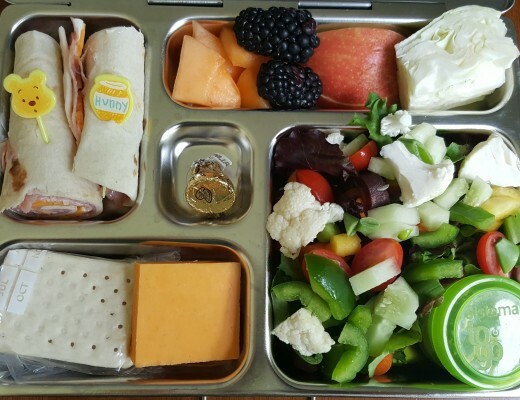 The lunch below was packed for my husband. 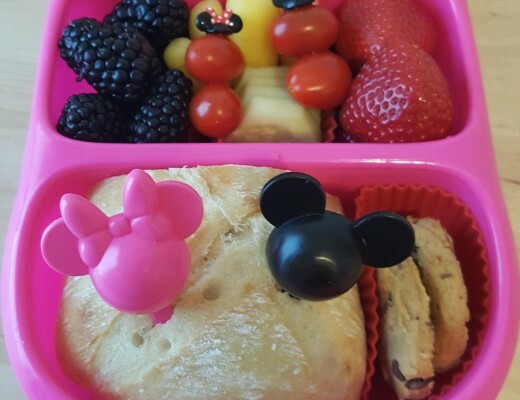 It included a madeleine (from Target), veggies with a sand dollar cupcake ring, tomatoes, Chex mix, a turkey sandwich, and fruit with a shell cupcake ring. The little Sebastian on the sandwich is actually a button. Thanks for reading. I hope you enjoyed our look back at fun with Ariel. 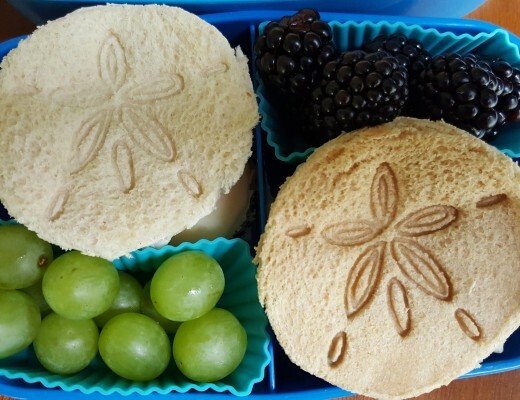 If you would like to see one of my all time favorite sea themed lunches, you can visit the post I wrote about our trip searching for sand dollars.